Mark Chambers is a extremely active campaigner against the UNJUST, UNFAIR AND CORRUPT FAMILY COURT SYSTEM IN THE UK ! Mark is unrelenting and unstoppable in his quest to seek justice on behalf of all the children and families affected by the barbaric and outdated practice of forced adoption! We understand the need in some cases for family courts to be involved in serious cases of child abuse, but all to often this is not the case! Children are being torn from loving families and placed with strangers with unscrupulous adoption agencies and local authorities making vast quantities of money per year from our children and our heartache. 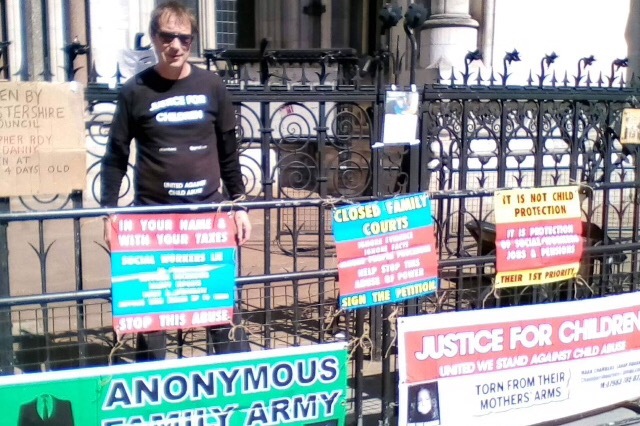 Mark is trying to raise awareness of this and the secrecy of the closed family courts and the gagging orders they impose on parents and the media by embarking on a hunger strike outside the Royal Courts of Justice London commencing Tuesday the 20th November/Wednesday the 21st 2018 . This entry was posted in Uncategorized and tagged chambers, mark. Bookmark the permalink.